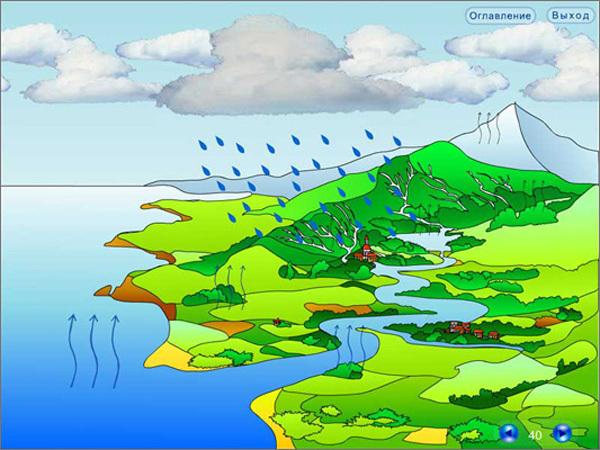 Vivid animations, dynamic drawings, diagrams and tables presented in this software help pupils to examine the laws of nature; understand the difference between animate and inanimate nature; learn about the circulation of matter in nature, the change of seasons, day and night; develop the bump of locality, etc. All the sections of the program are voice annotated, which makes it fun to watch and stimulates further studies. Abundant visual and demonstration materials, as well as interactive assignments, make this software an irreplaceable teacher’s aid in class (providing for highest possible visualization of the learning process) and a fascinating source of information for pupils. The software has been designed in cooperation with methodologists and teachers. A special DVD-package for educational institutions has been provided for use with an interactive whiteboard. The package includes a CD with the program and a User’s Manual which includes elaborate recommendations on how to use the program in combination with an interactive whiteboard, as well as thematic lesson plans. While perceiving the laws of nature, a pupil gets acquainted with Animate and Inanimate Nature, learns how to distinguish between animate and inanimate objects (with a preliminary slide-show and a summarizing game) and notices their interrelationship. "Save the Nature" page promotes ecological education of elementary school pupils. While studying the Change of Seasons. 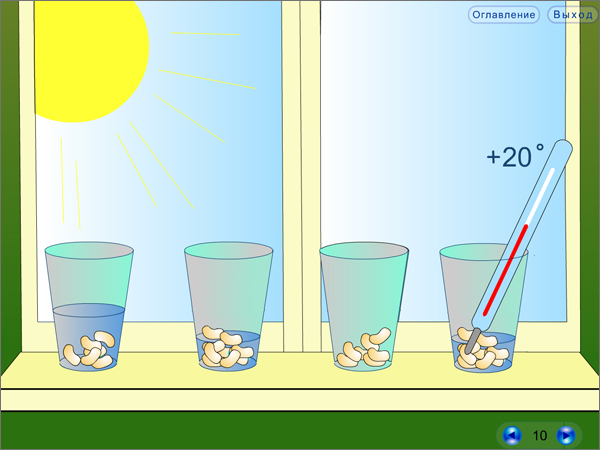 Change of Day and Night section, pupils can watch animations showing the movement of the Sun and the Earth, learn the origin of the names of the days of the week, conduct a virtual experiment with a pocket flash light, identify the day part by a person’s activity, solve puzzles on the topic studied, etc. The Shape of the Earth. Compass Orientation section tells about the horizon and the movement of the Sun in the sky; the structure of a compass, its types and the principles of navigation by local landmarks; a globe as a model of the Earth, continents and oceans on the globe. A pupil can learn how ancient people imagined our planet, and obtain evidence of its spherical shape. The Reproduction and Spread of Flowering Plants section gives an idea of the diversity of flowering plants, contains information on the stages of fruit development from the flower, ways and reasons for spreading fruit and seeds, conditions for seed germination. In order to bridge the learnt material with the pupil’s environment and show her/him how the acquired knowledge can be applied, a pupil may be suggested to observe some natural processes, such as window freezing and laundry drying. The Circulation of Matter (Life) in Nature section builds a bridge to studying important topics of natural science at the next stage of pupils’ education – in junior high school. 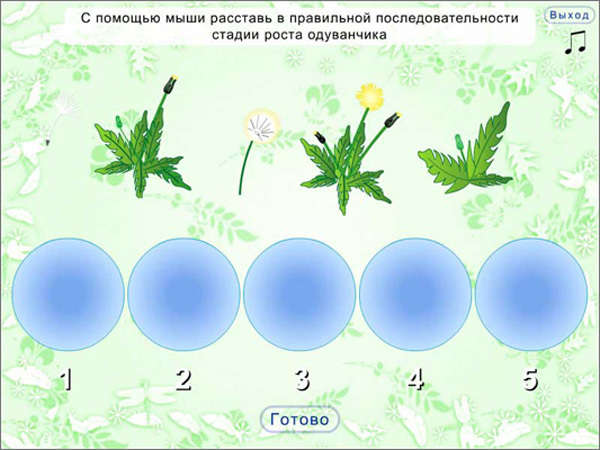 Narration, diagrams and animations tell a pupil about organic and non-organic substances, various food chains in nature, soil micro-organisms, principal participants of the circulation of matter in nature, etc. Each section contains entertaining summarizing assignments, such as games, puzzles, virtual experiments-demonstrations, interactive tests, etc. Dynamic diagrams help pupils to organize learning material and encourage its more efficient acquisition. The Test Yourself section contains fascinating interactive assignments which are geared not only towards revising certain topics of the course but also towards developing the pupil’s cognitive abilities as well as encouraging interest to the phenomena and processes studied. make a stone mosaic, etc. The assignments can be fulfilled in any order and more than once. A correct solution is accompanied by a message: "Good for you!”; in case of an error, a pupil is advised to try again.